I Me My: "Three Idiots" - A Bollywood Block Buster that Baffles? 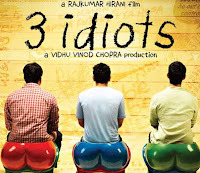 "Three Idiots" - A Bollywood Block Buster that Baffles? I watched this Bollywood movie 'Three Idiots' which apparently is currently as big of a block buster as is 'Avatar' in Hollywood. Are Indian parents that heartless/naive to drive their children into depression? Do Indian youngsters never challenge their parents? Why is no action taken against students who cheat on exams or violate basic rules in India? Why was the Professor caricatured? Do Indians in India dislike Indians in the USA? Why is that? Are the Indians I see in the US a poor representation of India and Indian culture? Why does this movie that bashes Indian Americans so popular in the USA? How does a movie goer in India afford a ticket that on an average costs him Rs. 140/- (about $ 4), when the net hourly earning of an Indian is only Rs 60/- (about $ 1.5)? I thought the male lead, Aamir Khan, is a really good actor, as were his two friends; the rest of the cast was a medley of caricatures who took away from the credibility of the story! The people around me appeared to be thoroughly entertained, in fact some of them had the songs and dialogues memorized! Apparently, the movie carries an important message to parents and teachers in India who stunt creativity and curiosity in young minds by forcing them to memorize instead of problem solving on their own. Whether this message finds it to the masses, past the slap stick humor in which it is so deeply embedded, is to be seen. I am hearing a lot about the movie. I need to see this soon. Very good questions raised. Yes, Indian parents do drive their children to depression. It is rather the pressure that is put upon them to study well and be geniuses. But yes, Indian children do rebel and manage to chart out their own individual ways. Yes, Indians in India seem to dislike Indians in USA or abroad. They like to believe that Indians who went abroad have left the country to serve another. Indians basically don't have much respect for other cultures leave alone the various cultures that are part of India, since they believe that theres is the 'best' culture of this world. Yes profs are not only caricatured but also mocked and laughed at in colleges. I remember this incident in my class, in a very prestigious college in Delhi wherein the prof walked out simply because the students wouldn't stop laughing at him. The Indians you see in the USA are poor representations of the Indians in India because they have grown out of their 'Indian' ways. And yes, there is a certain middle class in India which earns enough, thanks to the multinationals that have entered the country, who can pay not only for the film but also for a pack of popcorns; the smallest of which costs about Rs 60 ( a little more than a dollar). I don't whether I will be able to catch this film, but thanks for the review. Yours is certainly an intelligent one. i havent seen the film and dont plan to... no particular reason, am just not excited - the author is not among the favorites, the teasers of the moview make me go "Ugh!" rather than wow, so wont be able to present an answer. - Sometimes they do. More often, they just do their own thing without arguing in a subtle sort of way. - Bcs, the education system here is focused on the percentage of marks that you score . Because, it is easy to be unethical and get away with it. Because, like in the case of Prof. Sabharwal, you can also lose ur life for being too ethical. - Because, like EYE said, they always are. - This is a chicken and egg story. Indians in india think that Indians in the US dislike them too. - Errm, i m not sure of that one. Some of them are more "indian" than one wld c here. but whats being "indian" anyway... me no gets it. - Ha ha aha. no clue. How does a movie goer in India afford a ticket that on an average costs him Rs. 140/- (about $ 4), when the net hourly earning of an Indian is only Rs 60/- (about $ 1.5)? - Because, my dear, per capita income is a figure. Not the actual income of all Indians . Some make way more, and some make way less.. I really enjoyed the film because it was entertaining and funny but didn't take it too seriously. I don't think that all Indians should be judged by this film. Of course there are Indians who put pressure on their kids just as there are kids who rebel. If they didn't then all Indians would be doctors, engineers, or lawyers :) I also don't think that all profs are mocked in India. The character of the professor in the film was extremely eccentric and we have to remember than this film is categorized as a comedy. There are differences between Indians living in India and those living in other countries which can sometimes lead to conflicts but this doesn't mean that all Indians dislike Indians living in the US or vice versa. Many Indians have family members and friends living in both countries who are equally dear. This movie is popular in the US despite bashing Indian Americans because it's generally a light hearted comedy with some serious undertones. Overall I think that these generalizations cannot be applied to all Indians just like this movie doesn't represent all Indians. as for EYE's comment on Indian Americans: "Yes, Indians in India seem to dislike Indians in USA or abroad. They like to believe that Indians who went abroad have left the country to serve another." Disclaimer: I haven't seen the movie. 1. I don't think that is actually the case, i mean yes, the pressure here is too much, to perform, for one college seat you're competing against almost few hundred thousands. But this fact cannot be easily summaried by generalising that all parents do the same. Also, you've to understand that the only way for middle class here to break the economic shackles is education, given that besides cricket, no sport would make you popular. Also, education is the cheapest way to book your ticket to rise up in the social ladder. But to say, that all parents make their kids desparate and lead to suicide, that would be looking at only on end of the spectrum. Do kids challenge, both yes and No. remeber we've genuises like Sachin, Vishy and now even guys from small towns finding their way in the sport circuit. Again...it depends on the family...but since kids here stay with parents as long as 21..of course there is some influence. Both yes and No. NRIs who show-off, their foreign breed (unnecessary show-off) are tend to be ridiculed...but not the case with every1.. There are multi screens and single screens and why movie ticket, III than we shouldn't be able to buy jaguar as Tata did or Arcleor as Mittal did...we have huge disparity but check out the forbes and MNCs coming to India..well its a two-way process, they need to sell themselves to over 1bn people and if it creates some jobs...there lie economic sense. by the way III..we celebrate a Pravasi Bhartiya Divas ( day for Non resident Indians)...ironical!!! Id, i saw the movie last night. And came back with one correction - the hatred is not for NRIs. THe hatred is for students who follow the norms of the system and excel - the "maggus" - the people who learn by rote as our system requires and then get gud marks and the gud jobs. It has nothing to do with the guy settling outside India. Did not understand lot of your questions, specially the last question, there are cinemas in India which are not multiplexed, I saw the movie for 70 bucks in hyderabad, the cinema next to my house in bangalore has the ticked for 40 rupees, that is what most cinemas have. And I guess in no place the movie talked about NRI or US jobs, most of the engineers do get in job in US MNC just because of the fact that there are more tech companies in US then in India, and that is what the movie was referring to. Among the rich and middle class, yes. Since millions of kids in india don't go to school, they are driven to work at a tender age. They do. But parents have a lot on say in every decision. If they are caught, they are. Not sure. Maybe we are jealous. It's not a representation of India because you probably see only the ones who were privileged enough to make it to the US. It's not a proper representation. It's not popular because of that. Tickets in small towns are cheaper. haven't seen the film... but i liked the questions you asked... they are applicable to a more general audience too... thoughtprovoking! hi, had read this post a few days ago, then thought should be coming back and replying when i can do this in detail. now it seems that most of it is covered in previous comments. but well, here is my bit anyways. firstly, I do think that one cannot draw conclusions about the way things are done in a country based on one commercial film. a film at best, maybe be a half-way representation, but there is no way anyone can answer all those questions you asked, if the premise is only what the film talks about. now, assuming that the film merely caused you to think of these aspects, and that you are not looking for answers in the film, here is what i have to say. 2. about professors being caricatured...isn't a done thing everywhere? Caricaturing people in authority is hardly a new concept, (tell me one teacher in the archie comics who isn't), so why this question now? 3. I do agree with How Do We Know about the Indian American bashing...I don't think that is the point of the film...having said that, there is always a difference of opinion between Indians who have migrated elsewhere and those who have stayed here. I guess this is a question of both sides rationalising and negotiating their identities. With the kind of diversity in experience that one has staying in India alone, I doubt we can sketch out one definitive "Indian identity", this probably get further complicated with a shift to a different country. Given such a situation, when everyone is desperately trying to convince themselves that their decisions (whether that is to stay back, or leave) is the right one, differences, and arguments are bound to happen. The one thing I didn't get from you was did you like it or not? And would you recomment it. Once of the best movies my grandson and I ever enjoyed was the one you posted on, by the name of 'Three Deaths and a Funeral'. Loved it! Laughed through the whole thing. Haven't seen this yet, but now I'm putting it on my Netflick queue. :oD If India is anything like Thailand, I guess the parents there really rule their kids' lives (it's a cultural thing. In Thailand kids actually live with their folks until they get married, then perhaps the wife moves in with the family and has to be submissive to the mom-in-law, too).